Jib boom or no jib boom… that is the question. First we need to figure out why it’s there to begin with. The jib boom really only has its advantages when sailing “off the wind”. It allows the sail to maintain a well projected, fast sail shape as the sheet is eased off of centerline. As seen in the case of the Staysail, it will be used to fly a relatively small sail compared to the rest of the boat’s sail plan. 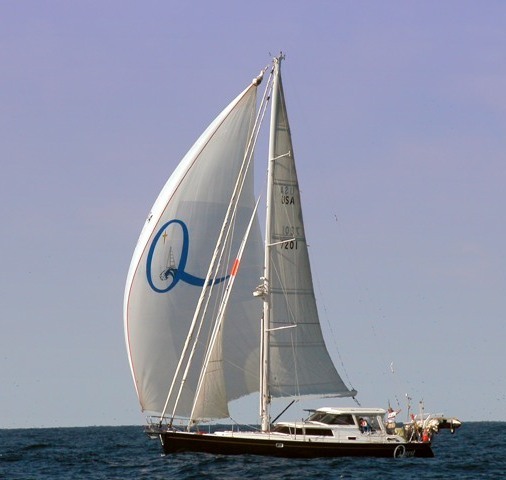 Therefore having optimum sail shape when “off the wind” has a small impact on the boat’s overall performance when flying the Staysail by using a jib boom. The downside to the jib boom is that it does make the foredeck a cluttered and very unsafe place to be, even without the sail being deployed. The slight advantage gained in performance is also lost after having to turn the bow so far down wind that the mainsail shadows the small staysail or jib, rendering it virtually useless. 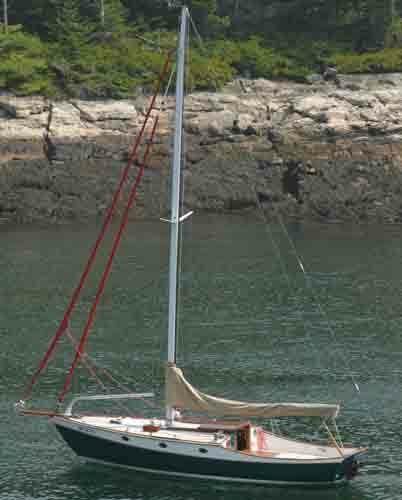 The jib boom does have its place however and that is in the case of a dedicated day sailor with no headsail options, where you are pretty much guaranteed to be in the cockpit and off of the bow, like on the Alerion Express for example (pictured right). Back to the cutter scenario, the staysail would only be unfurled (or set) in beam reach situations (or somewhere there-about) in conjunction with the other head sails, to gain boat speed in moderate conditions. Another configuration would be to use the staysail to control the boat in heavy weather conditions where a small headsail is required to work upwind. As I said earlier, only the first scenario would benefit from the jib boom in that it may slightly optimize sail performance in the beam reach, but this is nothing that a Barber Hauler can’t resolve. Beyond that, as the boat begins to turn downwind, from the beam reach to a broad reach, the staysail (if being used) is furled in (or doused) and the assymmetrical cruising spinnaker (if equipped) is hoisted; either by way of top down furler, snuffer, or a more traditional deployment method. These modern day cruising spinnakers allow the cruiser to move the boat downwind with exceptional performance, minimal rigging, and minimal crew work. They also allow the boat to be driven downwind on a broad spectrum of sail points, from just above ‘dead down’ to just below the ‘close reach’, depending on how the sail is cut. (Read more about cruising spinnaker options here) If winds are light, the Staysail could again be deployed in conjunction with the spinnaker to increase the boats performance (see pic. below) on or about the beam reach. The long and short of it is that most boats that we see today could benfit greatly by removing the jib boom. This would make the foredeck a safer place and also create a great space for hosting guests without all the clutter. Either way… go see your local rigger about setting up your boat properly and ask them if you need to keep that jib boom or not! To read about how to cruise “dead-down” using whisker poles click here. What are your thoughts on this. Just leave us a comment below. We’d love to hear from you. Assuming I want to get rid of the stay sail boom. and replace it with tracks, and cars with blocks, how do I position the tracks ? This is an answer that is best suited for a <a href=”http://www.chesapeake-sailmakers.com/”>sailmaker</a> as it ultimately depends on your sail cut. However, I can say that, for it to be self tending there needs to be a single track and car placed athwart-ships, in front of the mast, and one sheet. Much like a mainsheet and traveler set up. Hope that helps. Feel free to <a href=”http://theriggingco.com/contacts/”>email or call us</a> for further questions. Well, let’s not forget the self tacking ability of the boomed Jib/Stay sail. Most of the objections about these jib booms would be forgotten through the use of more modern materials allowing them to be less cumbersome. Boomed Jibs should not only be though of as cruising man’s device. I remember NS-14’s (a high performance, tactical dingy in East coast Australia) using them many, many years ago as a very high performance, self adjusting and self tacking device. A simple cable purchase system at the tack of the boom allowed to adjust head stay tension and in turn tune leech tension and twist.This 2 man, no trapeze class did not allow down wind sails so the ultra light jib booms were also very efficient as whisker poles. 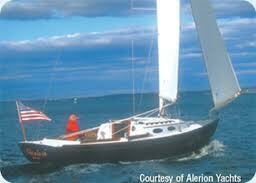 Yes a far cry from the simple cruising stay sail boom but I feel interesting enough to mention. Thanks for commenting and NS 14’s are a great new find for me, they look fun. Although when I google image them I see no sign of jib booms. Do you have a link to share I’d love to see it in action. A self tacking jib concept is employed on many new cruising boat designs with out the use of any boom. So I find the jib boom beneficial for performance on smaller sailboats, dinghies, or day sailors where there are no foresail options and being on the bow is unlikely. There have been many a sea mile covered under boomed out head sail and main. A fabulously stable down wind rig. Gybing takes an age and requires people well forward of the mast. Prior to departure on delivery trips I rig lines down both sides of the main boom. Then set up twin down hauls from the bow. A tube can be completed with a crew person by the mast. Centre jib and main. UN clip bow down hauls from main and staysail booms. Switch over to other side down hauls on both. Gybe and ease sheets, taking up on preventers (down hauls). Job done back to cruising. No rigging of new pole. No dragging jib across probably breaking battens. No one further forward of the mast, lovely. Haha…I was wondering what a tube is. Thanks for sharing. Ha! okay okay it should be called a staysail. read more at http://en.wikipedia.org/wiki/Staysail. I will change this, thanks for noticing. The truth is, a traditional staysail is any sail that is flown from a stay, which is very ambiguous. 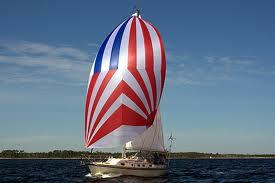 In modern times however the sta-sail/staysail is typically the stay-flown-sail closest to the mast. Ironically the Mizzen Staysail, isn’t flown from a stay at all.